When a car accident occurs, it’s critical that all possible causes of the accident be thoroughly investigated. It’s also critical that all evidence can be preserved to the fullest extent possible. In investigating car accidents, we never assume that there is only a single cause of the accident. Often, there are multiple factors involved. These factors may include a combination of improperly maintained roads, negligence on behalf of another driver (such as speeding or driving while intoxicated), and malfunctioning traffic signal devices (or devices that are not properly set based upon the speed). To determine the likely cause or causes of the accident, we often retain experts, including accident reconstructionists who assist with an investigation. In most car accident cases, an insurance company for the defendant will be involved. The insurance company will usually seek to avoid or minimize liability, often by insisting that their client was not responsible for causing the injuries, or that the injuries are not as severe as being claimed. They may also seek to shift responsibility for the accident to the injured person. The lawyers at Fein, Flynn & Associates understand the degree of proof that insurance companies require in order to enter into serious settlement negotiations. Typically, these require proving liability, as well as the extent of damages. Usually insurance companies are only willing to enter into serious negotiations at such time as they feel that they are likely to pay as much or more than a fair settlement amount at trial. In addition to helping our clients prove their case, we also seek to secure a fair settlement from defendants and their insurance companies prior to trial. If, however, defendants and insurance companies are not willing to enter into a settlement for a fair amount, our clients are well positioned for trial. 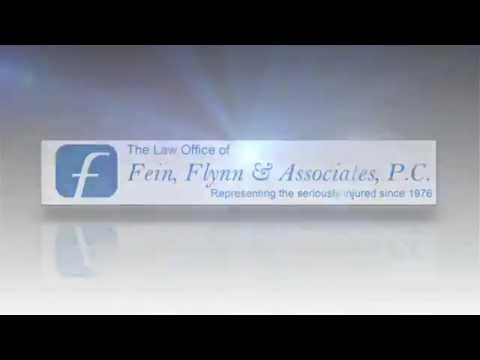 If you or a family member has been injured in a car accident, please call the lawyers at Fein, Flynn & Associates so that we can arrange to meet with you at a time that is convenient with your schedule. At this meeting, we can find out about your accident and the injuries sustained, and we can advise you of the alternatives that may be available to recover for these injuries. If we accept your case, we will do so on a contingency basis, which means that you will not owe us any fess unless and until we recover a settlement or verdict for you.